The natural, warm tones of oak are a great addition to any traditional kitchen looking to have some life injected into it. If your kitchen is more on the traditional side, then our solid wood oak worktops are perfect for complementing neutral tones, such as cream or white palettes. 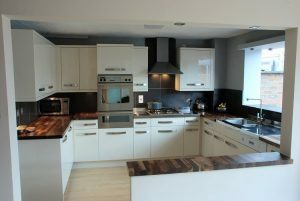 Cream and white can often appear bland or boring when careful thought is not put into the design process, which is why the natural, warm tones of oak are a great addition to any traditional kitchen looking to have some life injected into it. Having a solid wood oak worktop in your kitchen also gives you the added advantage of making a statement without being too extravagant. Country kitchens often appear warm and inviting, due to their cool colour palettes and warm wood tones. 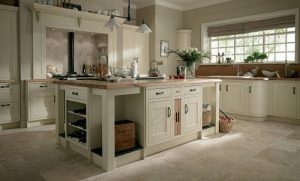 When choosing a solid wood worktop to complement a country style kitchen, it’s vital that the right tones are picked in order to give that natural, rural feel to the room. If you’re looking for a solid wood worktop to perfectly offset your kitchen’s country design, try opting for our solid wood oak stave worktops. Oak stave worktops are crafted by joining the individual pieces of wood together, providing a worktop that’s individual to you and allowing your kitchen to burst with an extra bit of character, which is exactly what a country kitchen needs. Country designs to have added little quirks in order to provide them with a more rustic feel. 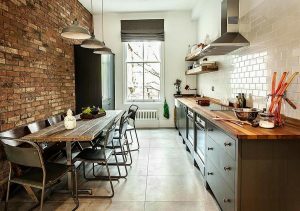 Industrial style kitchens tend to be stripped back in design, with colour palettes usually comprise of greys, neutrals, dark tones and rustic colours. The industrial style is also typically characterised by exposed brick walls and wood surfaces, which is why our solid wood worktops are a great choice for complementing any industrial kitchen. If your kitchen units are grey or dark in colour, try our euro walnut worktop. The rich, deep tones of the euro walnut worktop will make your kitchen look sleek whilst also bringing that bit of drama that industrial interior design brings to a space. Our wenge worktops are also a great addition to any industrial kitchen that’s seeking for a powerful statement piece that really breathes life into the design of your kitchen. Industrial style kitchens tend to be stripped back in design, with colour palettes usually comprise of greys, neutrals, dark tones and rustic colours. Modern design refers to clean, crisp lines and the use of simple colour palettes in order to give off a ‘minimalist’ feel. This means that interior designs are often simplistic and rely on natural light, allowing for spaces to have a ‘clean’ appearance. When choosing a solid wood worktop for a modern style kitchen, it’s vital that the chosen wood doesn’t darken the space and make your worktops become an eyesore, rather than blending in with the design. To keep your kitchen light and airy, our maple worktops are the best choice for any modern kitchen that’s aiming to be a naturally light space. It’s vital that the chosen wood doesn’t darken the space and make your worktops become an eyesore, rather than blending in with the design.